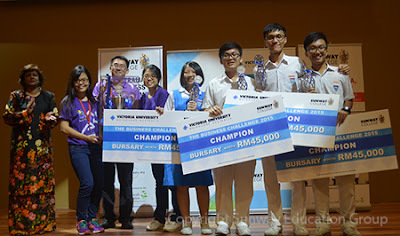 Team Origin comprised of Loke Jun Hou, Terrell Thu Jyee Chen, Low Zhen Ting and Heng Xi Lin of Chong Hwa Independent High School Kuala Lumpur beat 10 other teams from secondary schools around Malaysia to emerge champion at the recent Sunway College Victoria University (VU) Business Challenge 2015 Finals. The team members won themselves a bursary of RM45,000 each to cover the tuition fee for the 3-year VU Bachelor of Business programme at Sunway College. Oon Foo Sheng, Ong Li Wen, Jessie Ooi May Xian and Lim Zirou of Jit Sin High School Penang of team L3O Enterprise bagged the 1st Runner-up spot, winning themselves a bursary of RM30,000 each for study in the VU Bachelor of Business programme. Coming in 2nd Runner-up was team Heel the World. Made up of Lee Jie Qi, Teng How Yuen, Teh Keat Guan and Lim Wei Lun from Chong Hwa Independent High School Kuala Lumpur, the students won themselves a bursary of RM24,000 each. The VU Business Challenge, open to students from Chinese Independent Schools across Malaysia is a test of knowledge and skills, both mentally and physically. A total of thirty five teams who signed up for the Challenge were required to go through the first stage of The BIG Idea where each team had to come up with a business proposal based on a factual product or service. Their business proposals had to include business concept; target market; landscape competition; strengths, weaknesses, opportunities and threats (SWOT) analysis; and business idea or strategy. For the final stage of the Challenge, each of the teams were given eight minutes for the presentation of their business proposal with two minutes for question and answer. The annual Challenge requires students to engage themselves in a business environment encompassing various aspects of business in accounting, economics and marketing. Students are provided the opportunity to demonstrate effective problem solving and decision making skills. The VU Business Challenge 2015, the third so far was initiated by the Sunway Marketing Department, staff members and student bodies of the VU Business Club and the Sunway CPA Australia Student Charter. The Challenge is designed to test students on intellect, logic and problem-solving skills.